Born in West Auckland and with links to Helensville through the Glavish family, who settled here from Yugoslavia in the early 1900s and made their mark since in public roles, Richard Price has an action-packed background which includes travel to many parts of the world, three years’ frontline service in the British Royal Navy as a helicopter mechanic in Afghanistan and Norway and three years’ service as a member of the navy’s boxing team whose goal was to promote the military and support charities. Added to that, he has a title-winning track record in Muay Thay boxing and Taekwondo. Forge Fitness operates 24/7 and is staffed at set times each day. As well as use of a comprehensive range of equipment, members are offered a free programme to suit their individual needs when they join and personal trainers Yvette Amadia and Joshua Taitimu-Moore are available for hire for those wanting continued expert assistance in setting and reaching specific goals. Currently a high intensityclass called Fatigue runs on Mondays and Wednesdays at 6.30pm and more classes, such as Pilates, as well as six- and eight-week challenges, are in the pipeline for next year. Evidence that he has the community at heart can be seen in the fact that, rather than sell off the old gym equipment to offset some of the cost of the new, Richard donated it to Puatahi Marae, from where Richard Nahi shared it out among the marae, Wellsford Youth Club and a new gym in Pukekohe. Richard is grateful for the help he’s received while making changes to the gym (Richard Nahi and his whanau helped move the equipment, for example) and also for the patience clients have shown during the process. 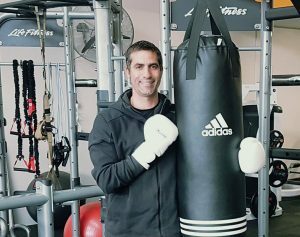 He enjoys the fact that members are of all ages and levels of fitness and that there’s a great feeling of camaraderie and a community feel among gym users.